2 The purpose of this presentation is to dispel myths and rumors that we all have heard. 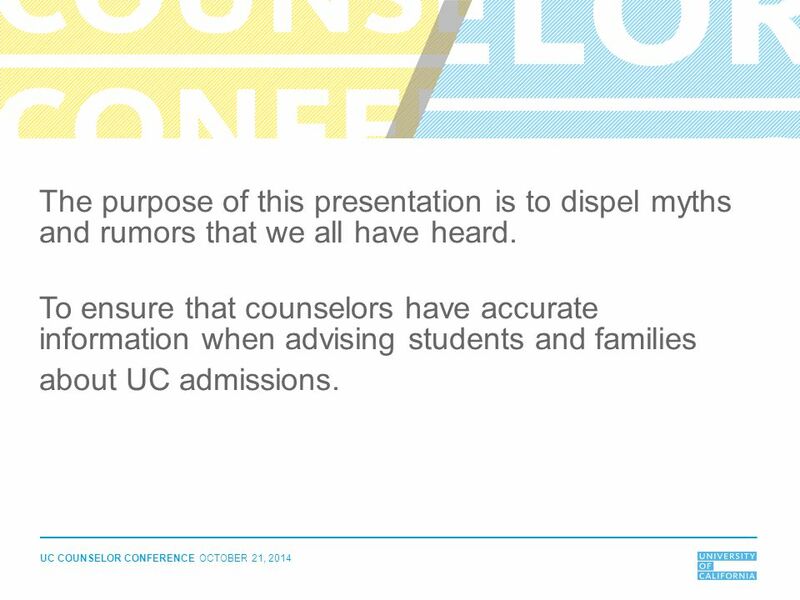 To ensure that counselors have accurate information when advising students and families about UC admissions. 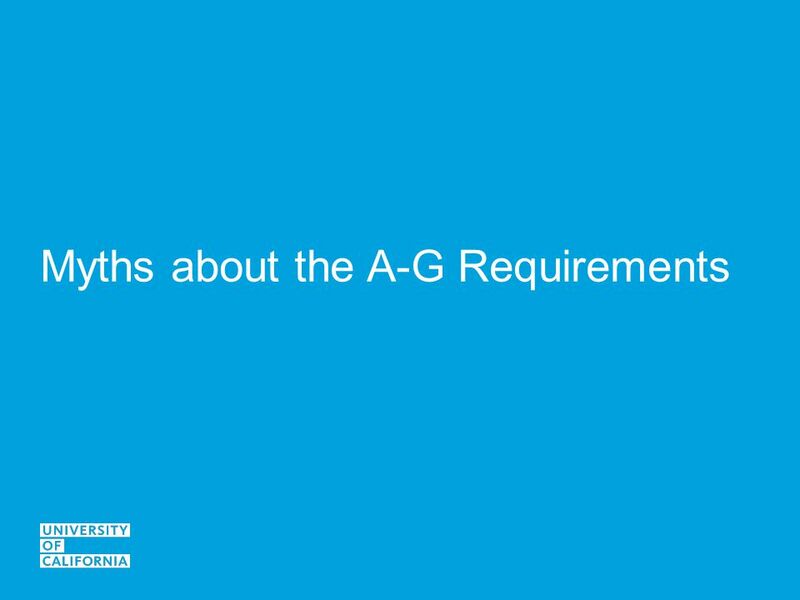 4 Myth 1: Repeating A-G courses is required. TRUTH: Yes and No. If the “a-g” course is needed to meet the minimum number of years for the subject requirement, yes a student must repeat a course in which they earned a deficient (“D”/”F”) grade. 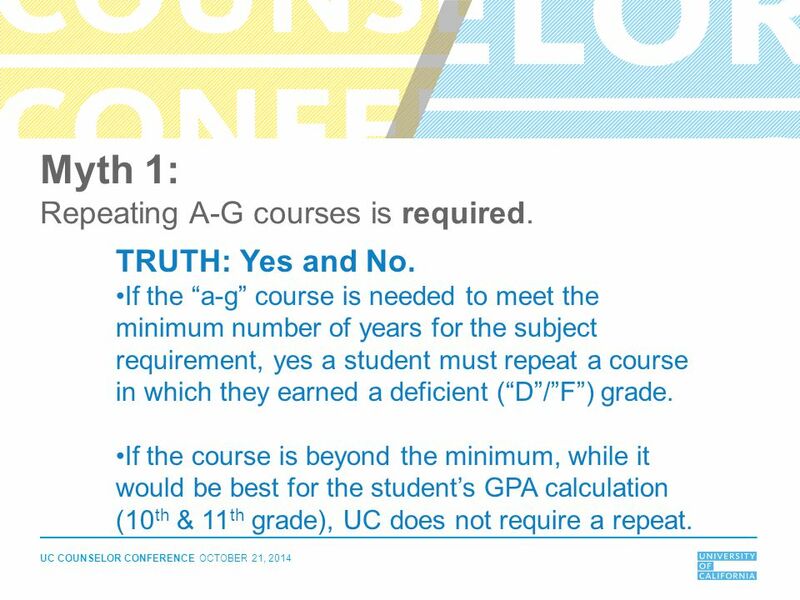 If the course is beyond the minimum, while it would be best for the student’s GPA calculation (10th & 11th grade), UC does not require a repeat. 5 Myth 2: Students don’t have to report D or F grades on the application if they repeated the course. If a student received one D or F grade, they will not be eligible or be admitted to UC. TRUTH: All applicants MUST report all “a-g”-type courses and grades—all attempts—first and repeat(s). All applications receive a full review A few students will be selected despite of one wayward grade. Student has only completed French 3, they need another course to meet the two year minimum requirement for area “e” Language other than English. Student earned two “D” grades in Algebra 1; completed Geometry and Algebra 2 with grades of “C” or better, they need another year of math to meet the area “c” mathematics subject requirement. 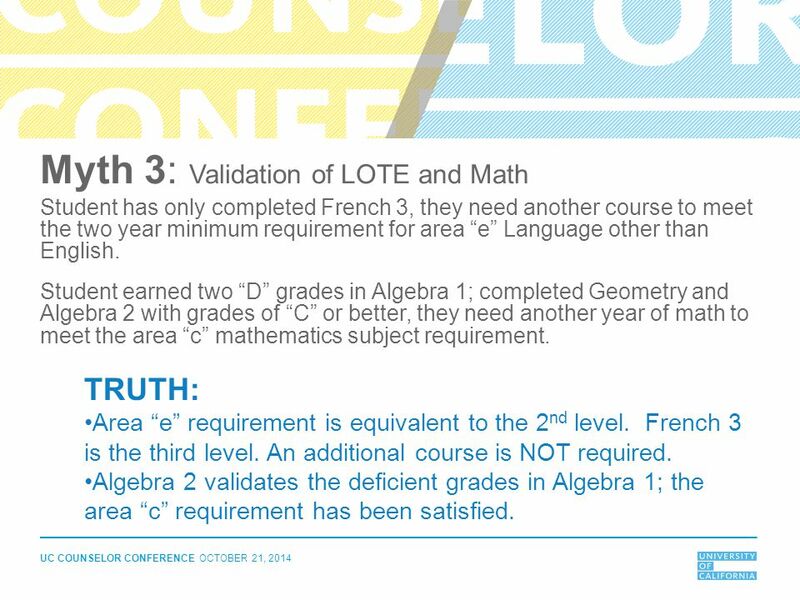 TRUTH: Area “e” requirement is equivalent to the 2nd level. French 3 is the third level. An additional course is NOT required. Algebra 2 validates the deficient grades in Algebra 1; the area “c” requirement has been satisfied. Calculus is not required for admission. 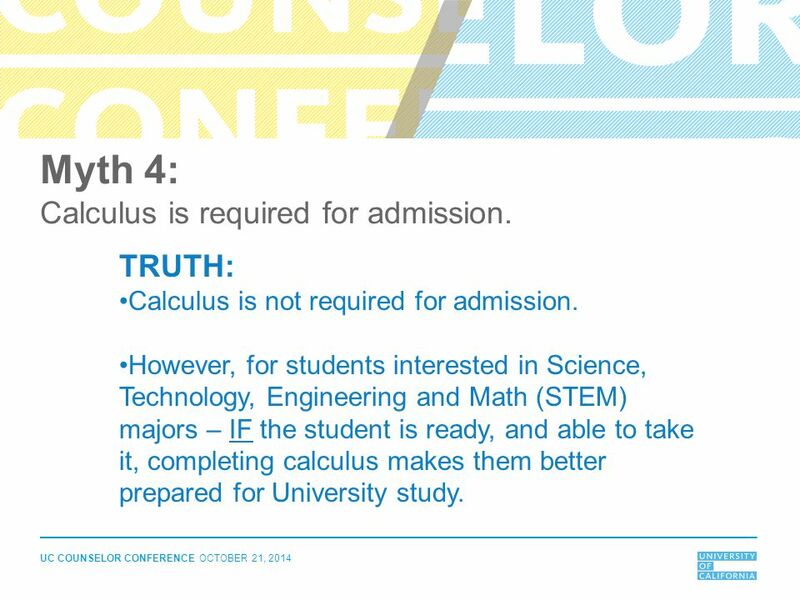 However, for students interested in Science, Technology, Engineering and Math (STEM) majors – IF the student is ready, and able to take it, completing calculus makes them better prepared for University study. 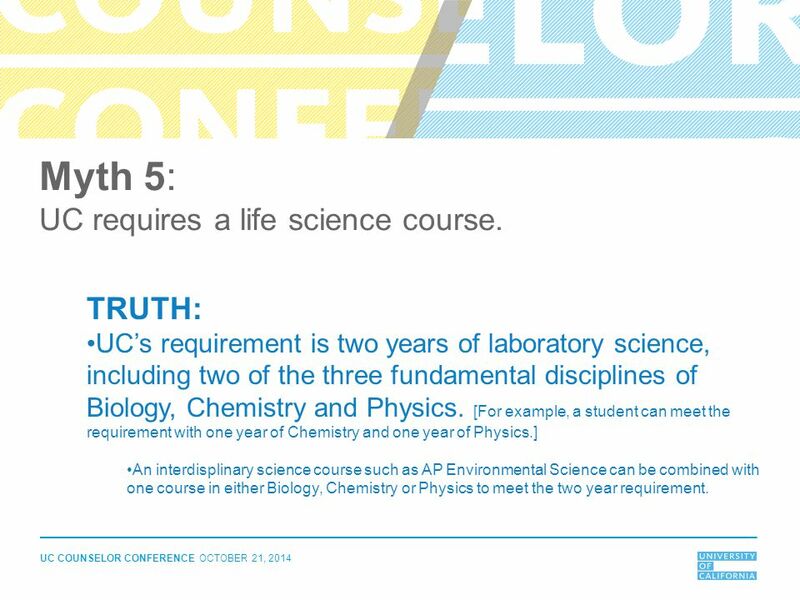 UC’s requirement is two years of laboratory science, including two of the three fundamental disciplines of Biology, Chemistry and Physics. [For example, a student can meet the requirement with one year of Chemistry and one year of Physics.] An interdisplinary science course such as AP Environmental Science can be combined with one course in either Biology, Chemistry or Physics to meet the two year requirement. 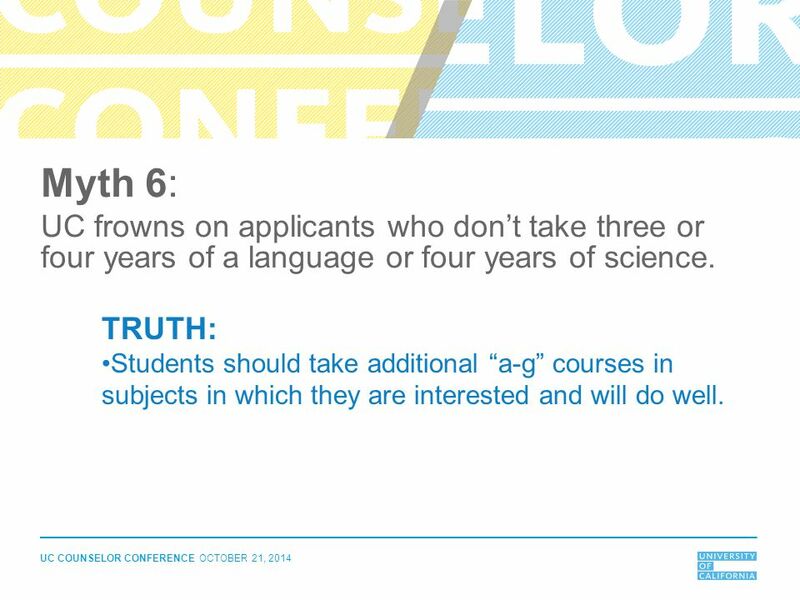 9 Myth 6: UC frowns on applicants who don’t take three or four years of a language or four years of science. TRUTH: Students should take additional “a-g” courses in subjects in which they are interested and will do well. 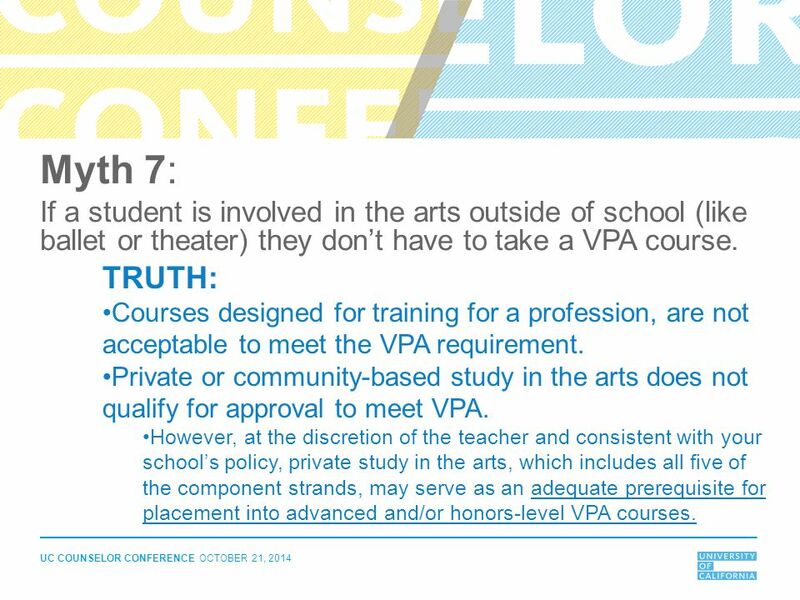 10 Myth 7: If a student is involved in the arts outside of school (like ballet or theater) they don’t have to take a VPA course. TRUTH: Courses designed for training for a profession, are not acceptable to meet the VPA requirement. Private or community-based study in the arts does not qualify for approval to meet VPA. However, at the discretion of the teacher and consistent with your school’s policy, private study in the arts, which includes all five of the component strands, may serve as an adequate prerequisite for placement into advanced and/or honors-level VPA courses. 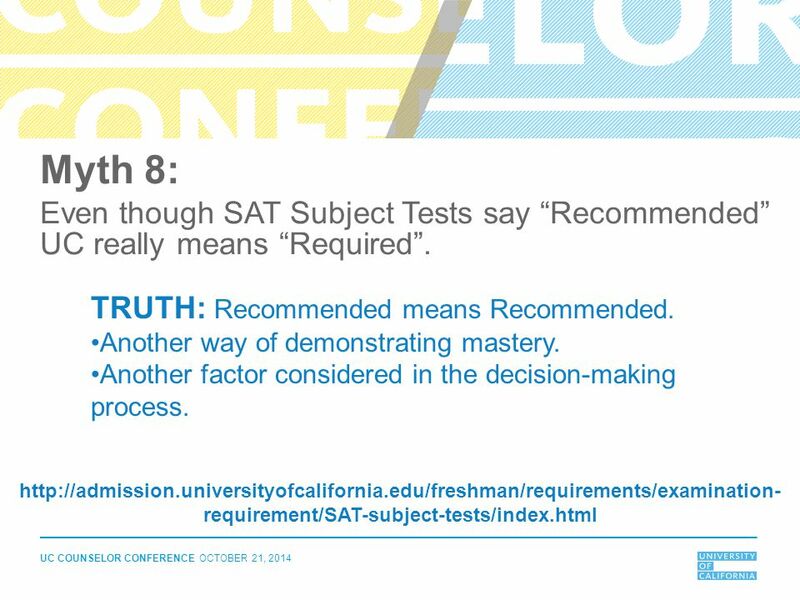 11 Myth 8: Even though SAT Subject Tests say “Recommended” UC really means “Required”. TRUTH: Recommended means Recommended. Another way of demonstrating mastery. Another factor considered in the decision-making process. 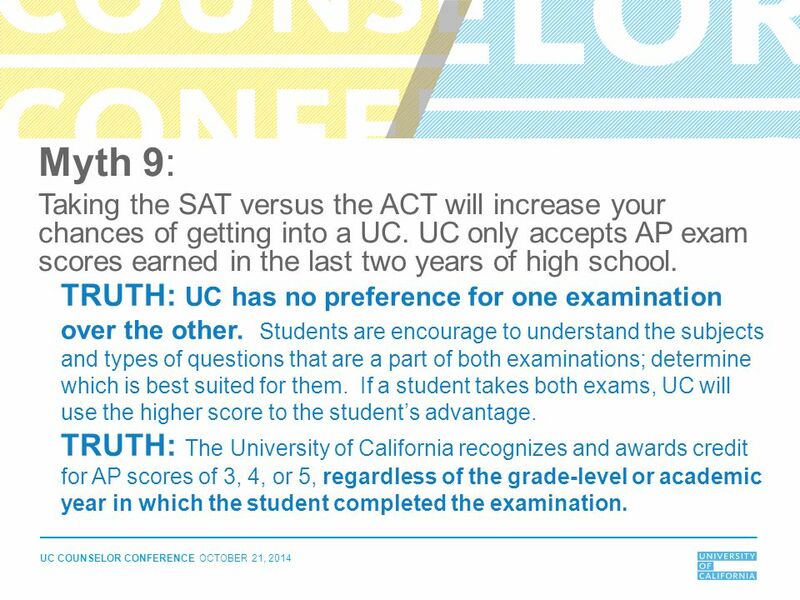 12 Myth 9: Taking the SAT versus the ACT will increase your chances of getting into a UC. UC only accepts AP exam scores earned in the last two years of high school. TRUTH: UC has no preference for one examination over the other. Students are encourage to understand the subjects and types of questions that are a part of both examinations; determine which is best suited for them. If a student takes both exams, UC will use the higher score to the student’s advantage. TRUTH: The University of California recognizes and awards credit for AP scores of 3, 4, or 5, regardless of the grade-level or academic year in which the student completed the examination. 13 Myth 10: Students must take the AP exam in order for the GPA to be weighted for completion of the AP course. 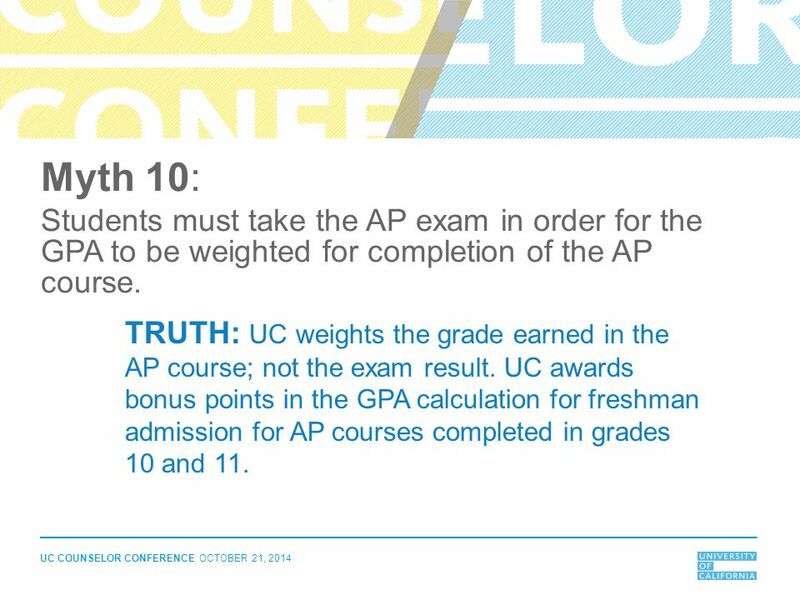 TRUTH: UC weights the grade earned in the AP course; not the exam result. UC awards bonus points in the GPA calculation for freshman admission for AP courses completed in grades 10 and 11. 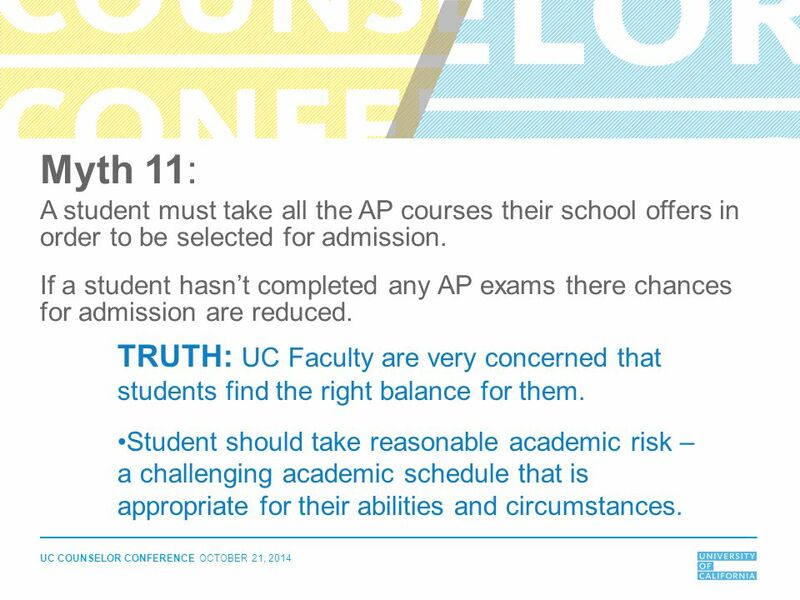 14 Myth 11: A student must take all the AP courses their school offers in order to be selected for admission. If a student hasn’t completed any AP exams there chances for admission are reduced. TRUTH: UC Faculty are very concerned that students find the right balance for them. Student should take reasonable academic risk – a challenging academic schedule that is appropriate for their abilities and circumstances. 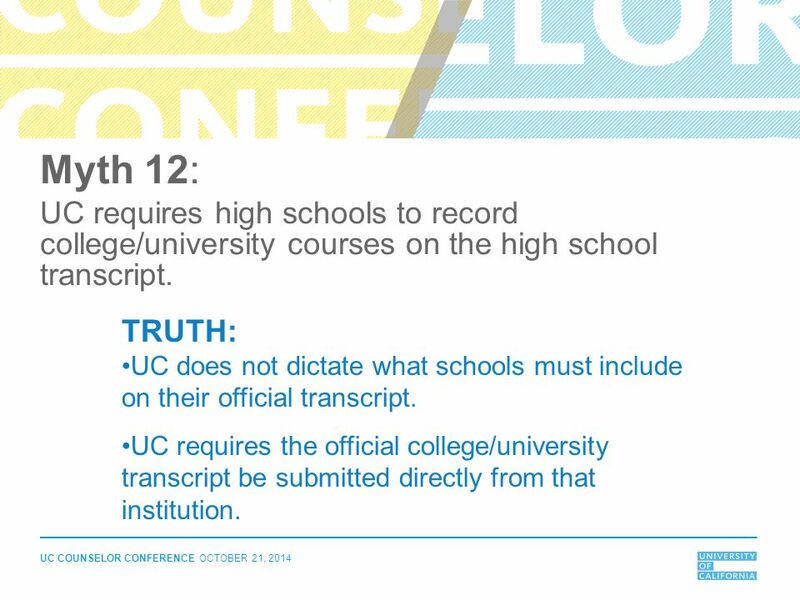 15 Myth 12: UC requires high schools to record college/university courses on the high school transcript. 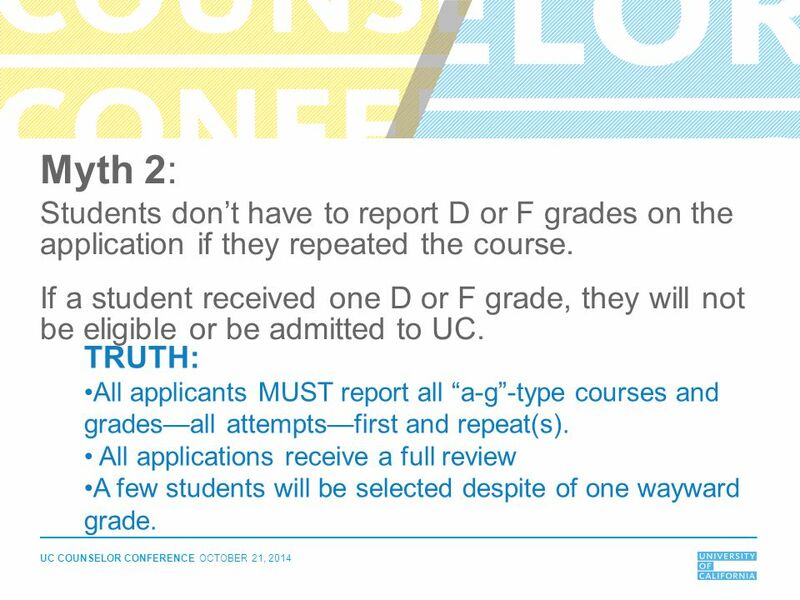 TRUTH: UC does not dictate what schools must include on their official transcript. UC requires the official college/university transcript be submitted directly from that institution. 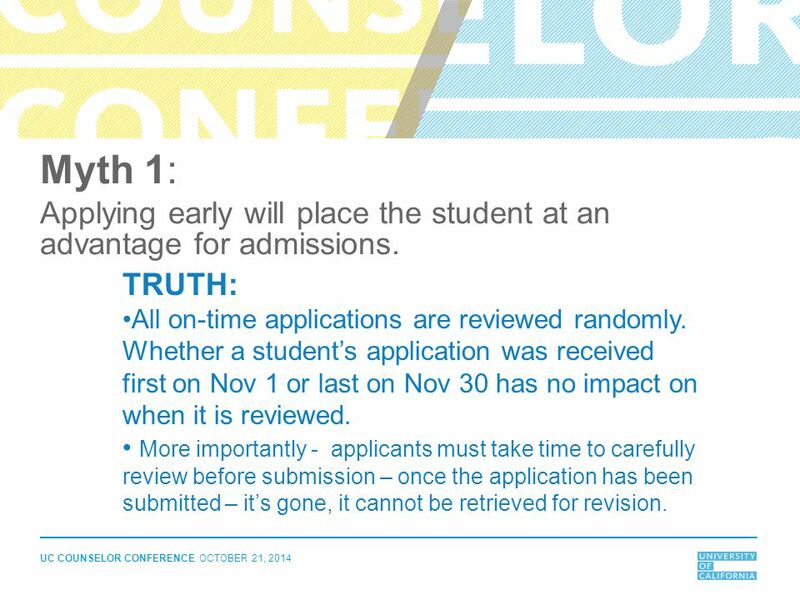 17 Myth 1: Applying early will place the student at an advantage for admissions. TRUTH: All on-time applications are reviewed randomly. 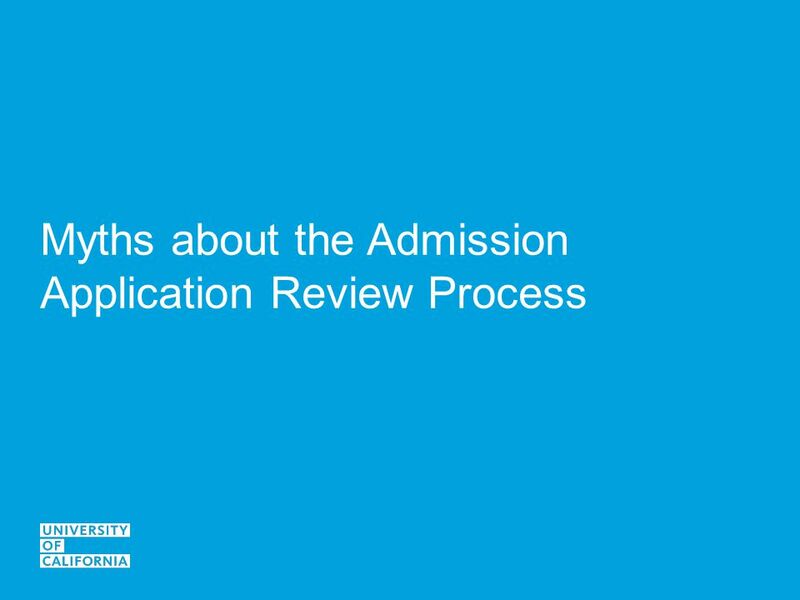 Whether a student’s application was received first on Nov 1 or last on Nov 30 has no impact on when it is reviewed. More importantly - applicants must take time to carefully review before submission – once the application has been submitted – it’s gone, it cannot be retrieved for revision. 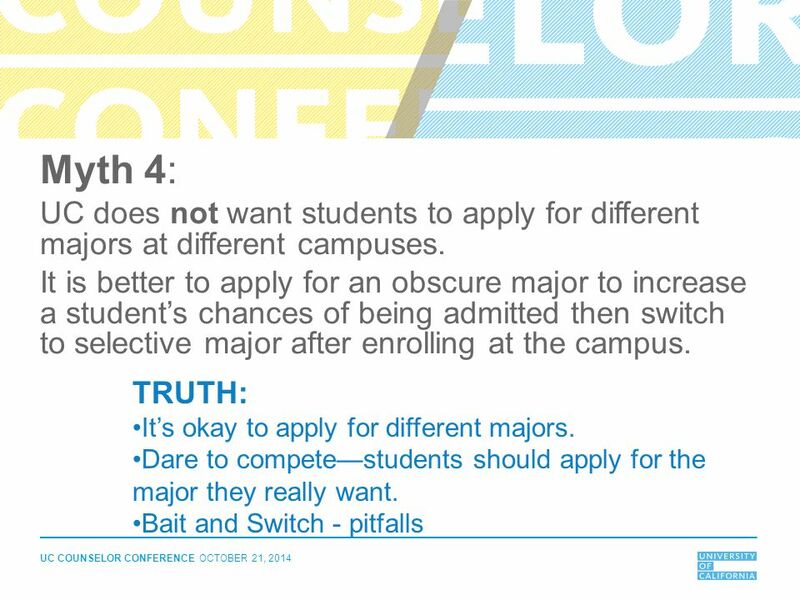 18 Myth 2: Application review outcomes are shared among campuses for the purpose of making selection decisions. 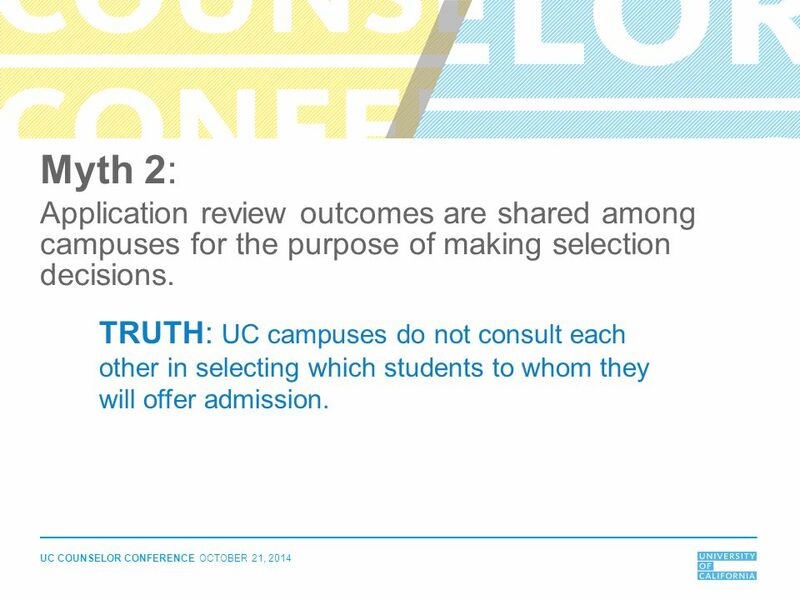 TRUTH: UC campuses do not consult each other in selecting which students to whom they will offer admission. 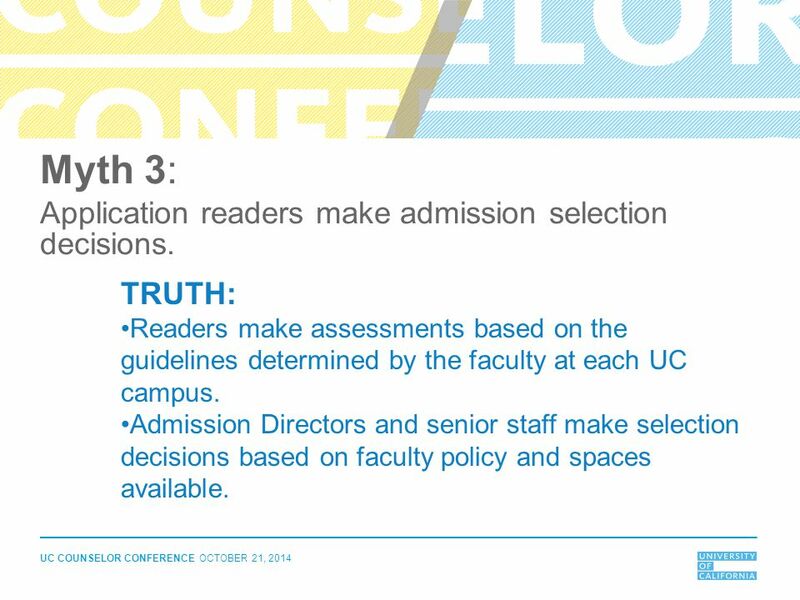 Readers make assessments based on the guidelines determined by the faculty at each UC campus. Admission Directors and senior staff make selection decisions based on faculty policy and spaces available. 21 Myth 5: If a student has family members who attended UC or have connections with a campus (such as by taking summer session courses or participating in outreach/academic preparation program at a campus) that can increase their chances of being admitted. 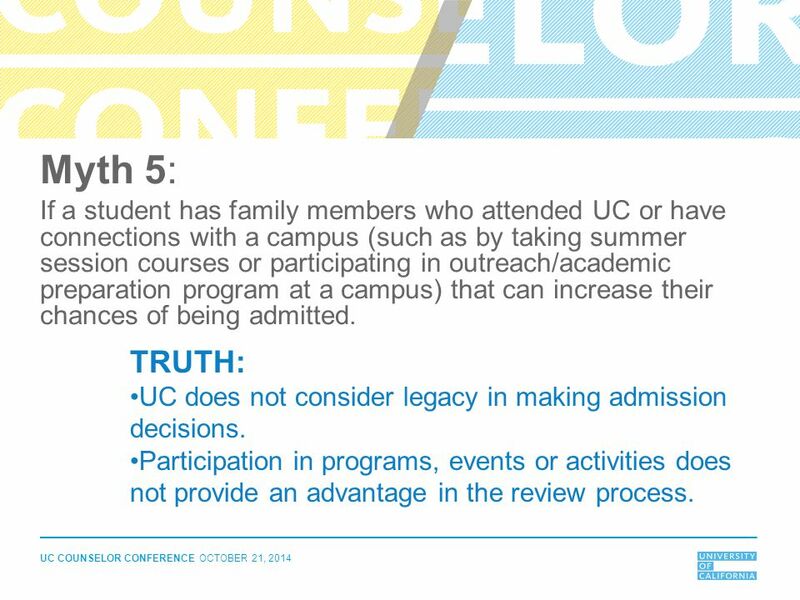 TRUTH: UC does not consider legacy in making admission decisions. Participation in programs, events or activities does not provide an advantage in the review process. 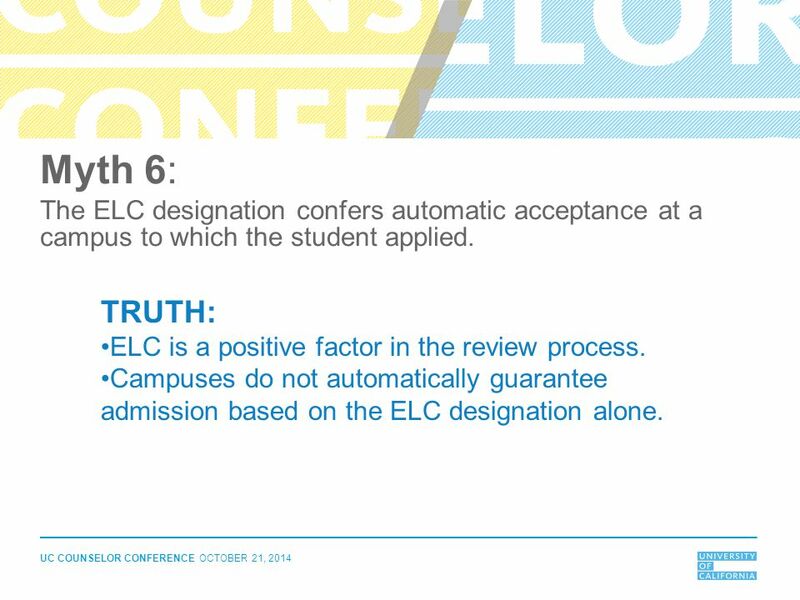 22 Myth 6: The ELC designation confers automatic acceptance at a campus to which the student applied. TRUTH: ELC is a positive factor in the review process. Campuses do not automatically guarantee admission based on the ELC designation alone. 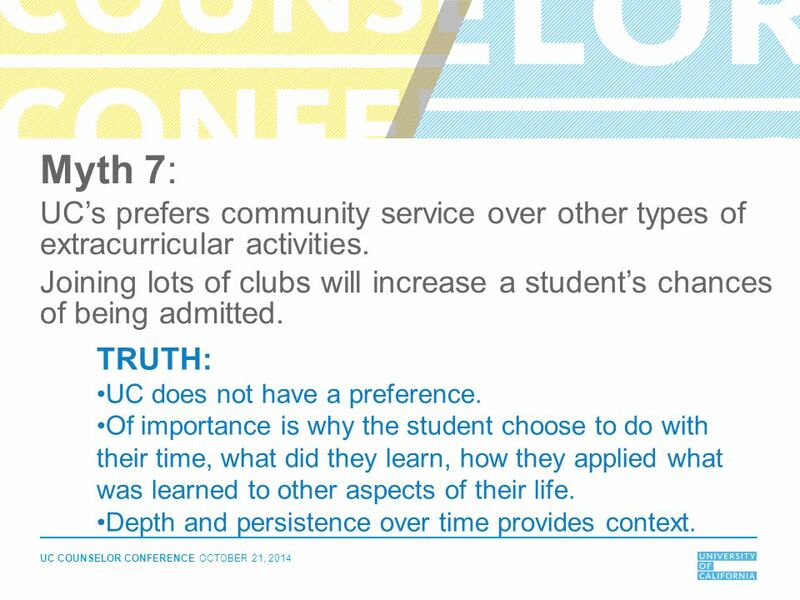 23 Myth 7: UC’s prefers community service over other types of extracurricular activities. Joining lots of clubs will increase a student’s chances of being admitted. TRUTH: UC does not have a preference. Of importance is why the student choose to do with their time, what did they learn, how they applied what was learned to other aspects of their life. Depth and persistence over time provides context. 24 Myth 8: A student has to overcome some obstacle/be disadvantaged to present a more compelling story for selection in the admission process. 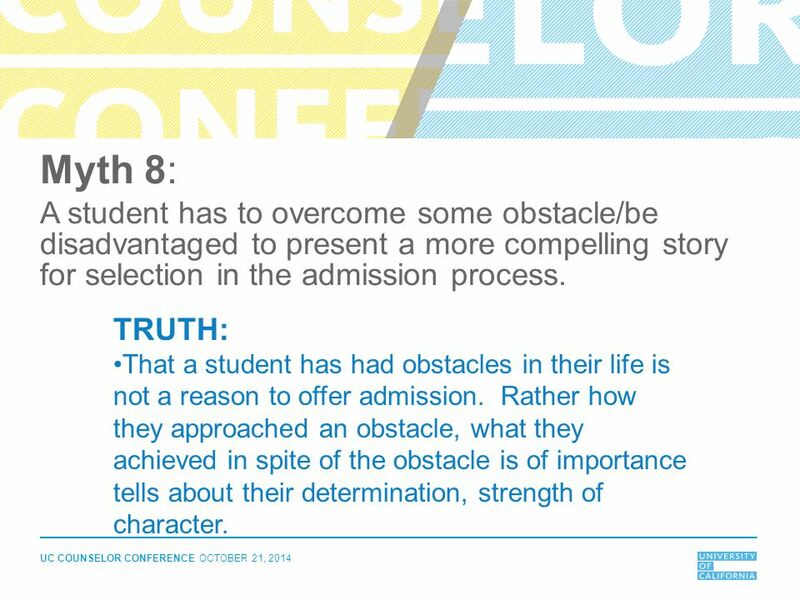 TRUTH: That a student has had obstacles in their life is not a reason to offer admission. Rather how they approached an obstacle, what they achieved in spite of the obstacle is of importance tells about their determination, strength of character. 25 Myth 9: A student who attends a “good” school and has a parent/guardian who have college degrees are disadvantaged in the process. 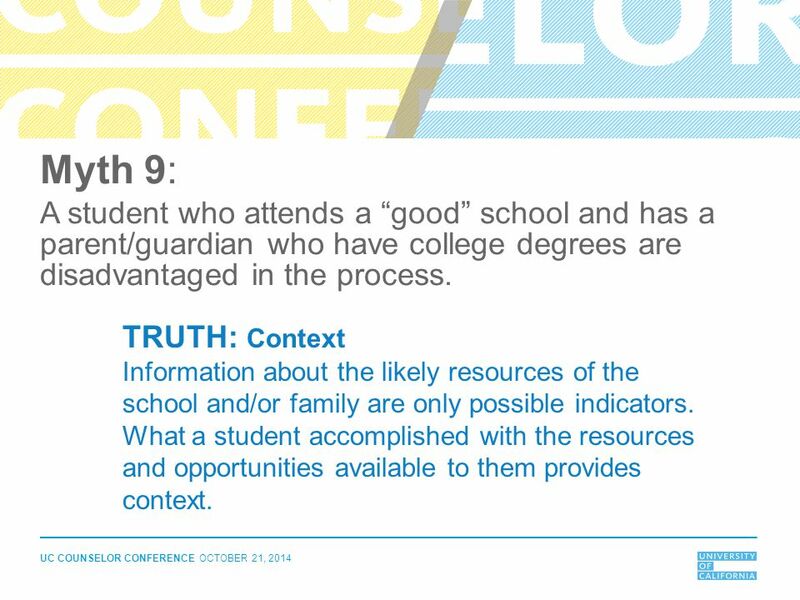 TRUTH: Context Information about the likely resources of the school and/or family are only possible indicators. What a student accomplished with the resources and opportunities available to them provides context. 26 Myth 10: Only students with a perfect SAT or ACT score are admitted. All student with the average GPA from last year will be admitted next year. 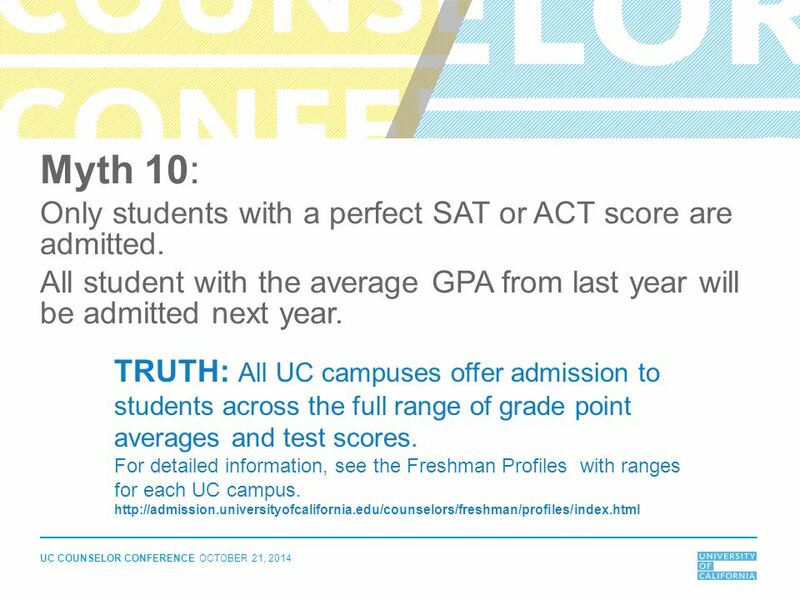 TRUTH: All UC campuses offer admission to students across the full range of grade point averages and test scores. For detailed information, see the Freshman Profiles with ranges for each UC campus. 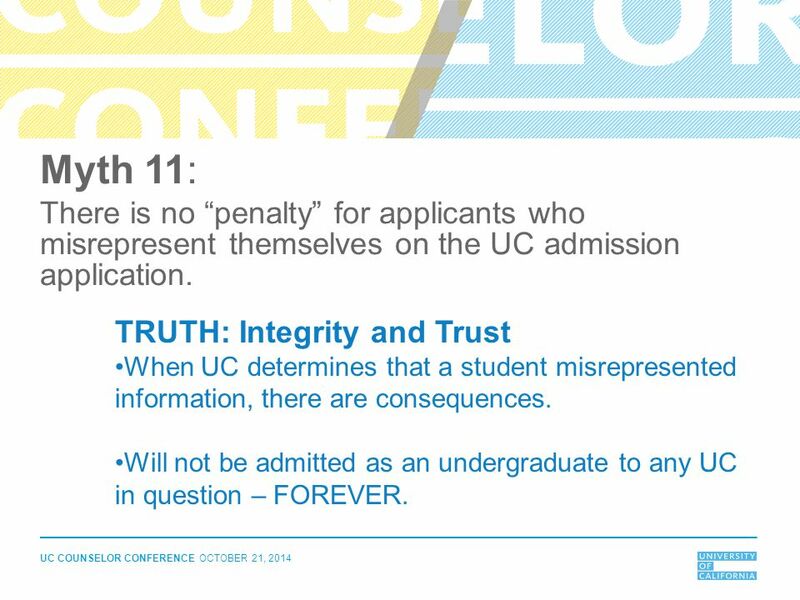 27 Myth 11: There is no “penalty” for applicants who misrepresent themselves on the UC admission application. TRUTH: Integrity and Trust When UC determines that a student misrepresented information, there are consequences. Will not be admitted as an undergraduate to any UC in question – FOREVER. 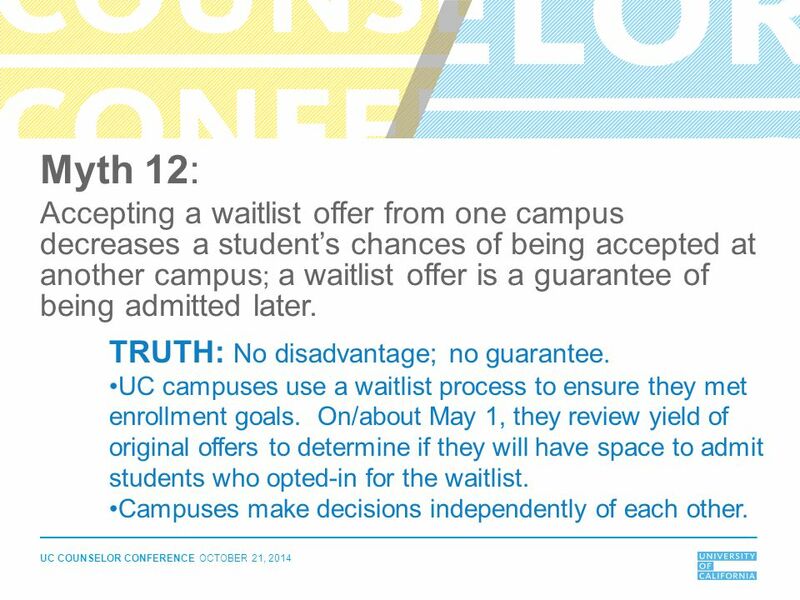 28 Myth 12: Accepting a waitlist offer from one campus decreases a student’s chances of being accepted at another campus; a waitlist offer is a guarantee of being admitted later. TRUTH: No disadvantage; no guarantee. UC campuses use a waitlist process to ensure they met enrollment goals. On/about May 1, they review yield of original offers to determine if they will have space to admit students who opted-in for the waitlist. Campuses make decisions independently of each other. 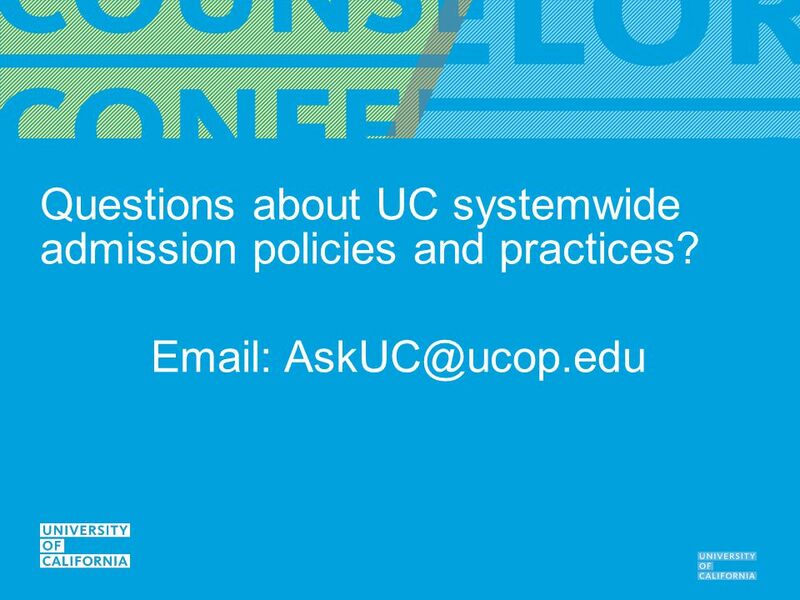 Questions about UC systemwide admission policies and practices? 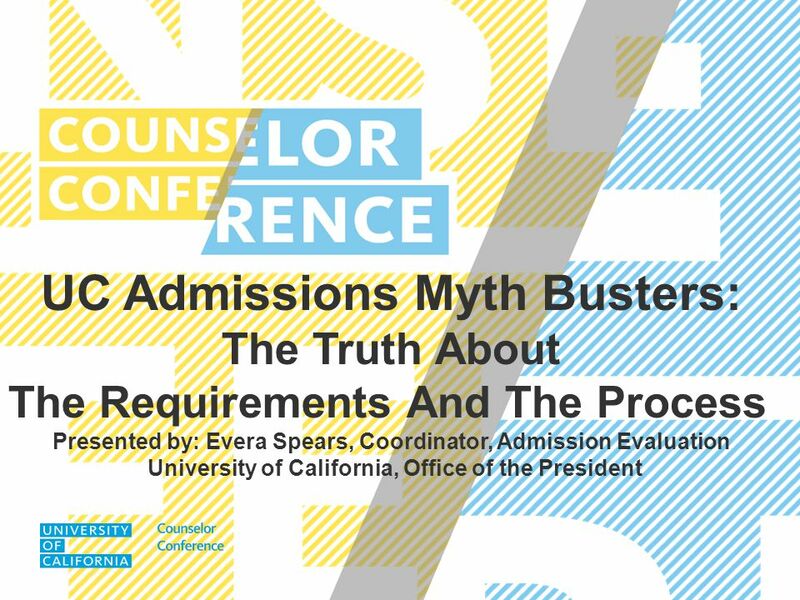 Download ppt "UC Admissions Myth Busters: The Truth About"
UC Admissions Kelly Harris, M.S. UC External Holistic Reader Counseling. This is where it all begins…...  9 th grade group meeting about your four year plan, transcripts, graduation paths and what you need to graduate.  What. HIGH SCHOOL /COLLEGE DUAL ENROLLMENT Information And Procedures * Subject to change based on legislative action. COLLEGE CREDIT PLUS Blanchester H.S. February, 2016.